The fact that low-income Americans are somewhat less likely to purchase things online is not too much of a surprise, as those with lower incomes might be expected to be less active shoppers generally. In fact, low-income Americans – defined in this survey as those who reported household incomes of less than $25,000 annually – are less frequent shoppers than the more well-off. Some 56% of low-income Americans go shopping once a week or more often, while 63% of those whose annual household incomes are over $60,000 annually shop once a week or more often. Low-income online Americans generally are less likely to use the internet for the range of online shopping activities about which we queried. 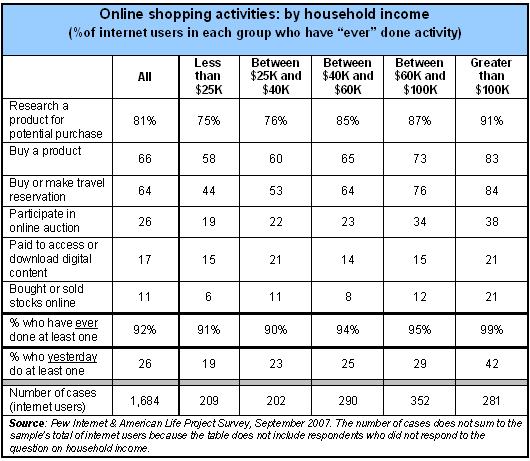 Compared to upper-income internet users, they are half as likely on a typical day to do something relating to shopping on the internet. It is important to keep in mind that online access varies by household income. Although low-income internet users are nearly as likely as high income ones to have ever done any of the online shopping activities listed, all low-income Americans are less likely to have done them. This is because their internet access rate is about half that of upper-income Americans. Notwithstanding these patterns of access and use of the internet to shop, certain features of online shopping might make using the internet for shopping very attractive to low-income people. As sociologists who study the poor have noted, being poor often means spending more time to carry out tasks many of those with higher incomes take for granted.7 Dependence on public transportation means it takes longer to get from point to point. Low-wage jobs generally have less flexibility for dealing with medical or child care problems, which creates time pressures in dealing with work- versus personal time trade-offs. Low-income people might also be expected to benefit most from finding bargains online – something half the online population sees as a benefit of using the internet to shop. Low-income people are more likely than the well-off to see the risks of sending personal and credit card information online, and less likely to see the benefits. Although the convenience and time-saving benefits of online shopping help most people overcome worries about security, the way people weigh the convenience versus safety trade-off varies by socio-economic status. The share of internet users who express worries about sending credit card or personal information over the internet is about the same as the proportion of users who say online shopping is convenient – the numbers are 75% and 78%. When focusing only on those who “strongly agree” with propositions about security and convenience, the picture is a bit different: 36% of respondents strongly agree that they don’t like sending personal or credit card information online, while 25% strongly agree that online shopping is convenient and 21% strongly agree that it saves them time. Rendering the data differently, 31% of internet users either strong agree that the internet is a convenient place to shop or save them time. However the data are parsed, the message is clear: In general, people have worries about sending personal or credit card information online, but those concerns are balanced by the convenience and time-saving that go along with online shopping. For most online users, the scales tip toward going ahead and doing an online purchase. Notably, though, this rough parity in attitudes does not apply to those who sit at either end of the income distribution. For lower-income people – the 15% of online users whose annual household incomes are below $25,000 – the internet is more likely to be seen as a place where sending credit card or personal information is more troublesome than it is a convenience for shopping. The pattern reverses when looking at upper income Americans, the 15% of online users whose household incomes exceed $100,000 annually. Upper income Americans are more likely to herald the time-saving or convenience benefits of online buying and are less likely to see the risks of online transactions. People have worries about sending personal or credit card information online, but for most online users they are outweighed by the convenience and time-saving benefits of online shopping. Focusing on the percentage of people who strongly agree with these propositions, 44% of low-income Americans say they strongly agree that they don’t like sending personal information or credit card numbers over the internet. Half that number – 22% – of Americans with household incomes below $25,000 annually, strongly agree that online shopping is convenient. For upper income Americans – household where the annual income exceeds $100,000 – one quarter (25%) feel strongly in their concerns about sending personal information over the internet, while a greater number (36%) say they find online shopping convenient. The same pattern emerges for attitudes about the time-saving potential of online shopping. Nearly one-third of high-income people strongly agree that online shopping saves time, while roughly one-fifth of middle and lower income online users say this. 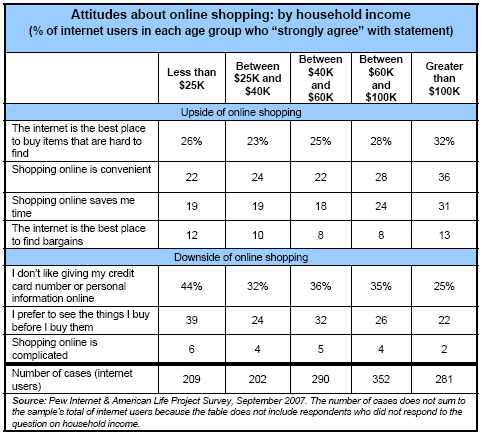 The differences in attitudes about online shopping at either end of the income spectrum show up in other ways. Low-income Americans are far more likely than high-income Americans to say they have become frustrated by the lack of information or their inability to find it while shopping online. Some 56% of Americans whose household incomes are under $25,000 per year say they have felt this frustration compared to 36% of those in households whose incomes exceed $100,000 annually who say this. 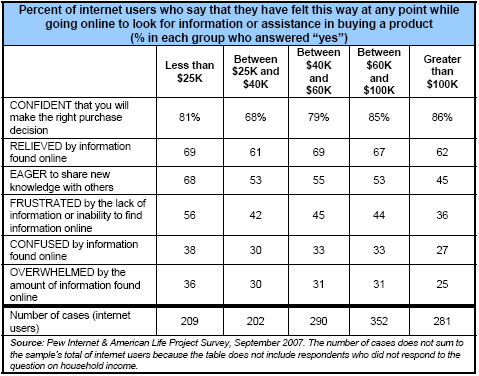 Similar differences for those in these income categories are evident when respondents are asked about confusion or feelings of being overwhelmed by the amount of information they find online. If it is true that the internet saves time on shopping and can help turn up bargains, then one might expect low-income people, whose time and money may be most scarce, to embrace it. But the data do not show that this is the case for low-income Americans. As the preceding analysis shows, low-income people assess the risks and rewards of online commerce differently than upper-income people. They are more likely to see potential hazards and less likely to see the benefits.